Got a big workout today. George came over and asked if I would help him jerk a stump out of the ground. He had cut down an old camphor tree but wanted to use the area for something and needed the stump removed. His plan was to wrap a chain around the stump and then jerk it out with his truck. When I looked at the stump that approach sounded a bit optimistic to me and, after a few hard jerks, we set about digging it out and cutting the roots one by one using a hand axe and chain saw. Every time we had cut what we thought was the last root holding it, we’d hook up the truck and jerk. Finally after 3 hours of digging, cutting, and jerking it came out. We were both worn to a frazzle but feeling victorious. I headed to the lake, stripped down and jumped in. Wow, did that feel good. Facing a real problem – the Kale and Collard greens have just about played out. I’m thinking that the end for my green drinks is now in sight for early July. The dark green Tuscan kale rolled over and died earlier this week and the curly leaf stuff is looking to follow suit. There are still a few new leaves popping out of the collards but I don’t think the plant will be able to keep up with the demand. I had hoped to be able to replace those with New Zealand spinach but those plants are not looking all that good either. No way am I going to buy them; that would just be wrong. I’m a real Mr. Fixit. I’ve been repair challenged all my life having been born with the equivalent of 5 thumbs so I get the shakes every time something breaks that seems repairable. This week I actually made 3 such repairs. I picked up the phone the other day and it was dead, dead, dead. What can go wrong with a phone beyond batteries and we had changed batteries just a few months back. I figured it was possible that the replacement battery just gave it up when Nancy chirped in and asked if it was the same handset she’d dropped yesterday. First I’d heard of it but took the back off the phone and sure enough, the connector between the battery and the phone had popped off. Hero. Went out to light the Holland grill and had to resort to a match when the electronic igniter wasn’t up to the job. The grill is new and it seems that every other lighting requires a match intervention. I decided to see if there was anything obvious and spotted nothing. A call to the manufacturer yielded a few suggestions and gave me the courage to start disassembling the heart of the grill. All the components seemed to be working individually but it wouldn’t consistently light and I also noticed that the flame seemed a bit too “orange”, a sign it was getting too much air. That’s a delicate adjustment but I dove in and, as if by magic, the flame is now mostly blue and it starts every time. The last repair job was on my favorite set of pruners. I was crunching down on a branch that was too big for them and they basically came apart in my hands. These are really good, really expensive clippers and also a gift from Joey so I was really bummed. I studied them closely and realized there was a way to take them apart and reassemble if I could get one nut off. It looked totally welded with rust but I took my time and soaked it in liquid wrench before breaking out the big wrench. It came apart, including a large spring that leaped out and I was able to put it back together- eventually correctly. It sort of worked but didn’t spring open the way it should have so I took it apart again and greased all the parts before reassembling. Shazamm – like new. Three fixes in one week is my new record. Three fixes in one month is probably a new record. I even did a sewing machine repair this month so I’m on a real roll. The new leaf blower showed up – as if by magic. I wouldn’t exactly call our flock of turkeys residents but they show up often enough now to say we are definitely on their morning walking route. Each time is an event worth noting because turkeys are such skittish birds and it’s fun to watch them pecking around in the pine straw. Yesterday when walking up the driveway to get the trash can, the paper, and yesterday’s mail, a small deer stepped out of the jungle between our house and George’s, no more than 50’ from me. It got my attention at first because I saw a flash of light brown moving in the trees and I suspected a very large dog encounter was imminent. Instead it was a young buck with small, velvet covered prongs and we just stopped and stared at each other for maybe 15 seconds before he calmly stepped back in the jungle. I’ve seen deer on the property before but this was the closest physical encounter. My morning walk up the driveway has another vital function – clearing away branches that have fallen overnight. Not every morning but for sure a few times a week, I have to remove a branch that is either blocking the driveway or would lodge in the undercarriage of the car. I hate that because then I have to climb underneath the car and extract it – not fun on wet gravel. On more rare occasions, I actually have to get the chain saw out to clear the driveway. All the joys of living in the great outdoors! Simon is part of a band formed by the staff at Tremont and they had their first official gig this past weekend. They named the group “Girl Scout Rock” after a large rock out in the creek by the camp. The band has a couple of guitars, a cello played like a bass, a sax, drums, washboard and who knows what else – something that sounds like a fife. They play campfire kind of music and, according to Simon, they brought the house down Saturday night at a local bistro. We’ve seen them in action via an online post. I’d say Environmental Science is a good career for the group. Nancy’s leaf blower died, finally. I hate that noisy thing so was not sad to hear the news. The bad part came when I explained that our annual yard equipment budget was dry so it would be at least 6 months before it could be replaced. Should I be surprised if one shows up on her next trip to town? The last time I went surf fishing in Palm Coast I noticed there was a substantial load of seaweed on the beach which I vowed to gather on the next trip to add to the compost pile. I did that a few years back and the garden seemed to like it just fine. Today was the day and I went back to the beach at MarineLand where I’d had a reasonable day fishing a couple weeks ago. As it turned out the fishing was great, the catching not so great but still loads of fun. I filled a 50 gallon trash bag with seaweed and will repeat that on the next few trips. By the end of the summer the garden should be a foot thick in seaweed mulch. We have this whole Palm Coast trip down pat now including using the timer function on the oven so that we have a meal almost ready to eat when we get home. The other thing that works in Palm Coast is the Flagler County Library is only 5 minutes from the bridge game. It looked like rain a couple trips back so I took the laptop and took advantage of the wi-fi at the library. I also discovered an untapped treasure trove of used books for sale; $1 for hardbacks, $.5 for paperbacks so on the next rainy day I’ll load up on books for my personal library. Here’s a factoid you should tuck away just in case………… A 50 gallon plastic trash bag full of seaweed yields about 30 SF of mulch. Since I have roughly 1000 SF of plantable garden space, all I need is 35 bags of seaweed to do the whole job. When you look at it that way it sounds like lots of work but if you frame it as 35 surf fishing trips, sounds like lots of fun. In general, the garden is mostly playing out. Picking just enough kale and collards to make a green drink every day, that would be one leaf of each. Plenty of cherry tomatoes but the other varieties are just about pooped out. And finally the green beans are showing signs of giving it up. I think there are two cuc’s still out there but they’re not looking all that good and we picked the last melon yesterday. We only got two melons so it was hardly worth it. I picked the first one too early and it was tasteless. The second one was pretty good but took up way too much space for one, small melon. The green peppers are producing steadily and we should start getting jalapenos next month. As I cut stuff out, the compost pile is growing substantially. One of the piles will be spread in late August, before I start the fall planting; the other will be ready in November, before the winter planting. The fall planting looks like the spring planting – tomatoes, cuc’s, and green beans. I’m going to plant some corn too but only to use up seed and grow compost. Who knows, maybe we’ll even get some corn. I enjoyed a nice, quiet father’s day. Tom and his family, Johnny, and my sister Eileen joined us for a rib feast from the new grill and to munch corn from the garden. It rained lightly on and off so we didn’t go into the lake but it wasn’t too hot to just sit around the dock and talk. Found a new place for lunch, Hidden Treasure, on Rose Bay, a bit north of New Symrna. It’s probably been there for 100 years but it’s new to us. If you liked Squid Lips and Bonefish Willy’s, Hidden Treasure fits right in. The genre is old fish camp and more than half of the seating is outside over the bay. Draft and craft beer, great seafood, cutie waitresses – what more could you ask for? They even have a talking shuffle board. About every 10 minutes it calls out – “hey, will somebody please come play me”. The first time it happened I looked over and wondered who had called out but after about the third time, I caught on. Too many green beans. I had no idea the beans would be as big and prolific as it is. I can easily pick a couple pounds a day and the plants are still putting out new blossoms. Even in this heat pollination is still going on, as a couple of bees explained to me when I was picking in their vicinity. Next season I’ll plant half as many and spread the planting over double the time. I had planned a fall planting but am thinking maybe not since we have a freezer full already. If I do plant, it will be just for fresh off the vine eating, once a week. Not enough corn. Nancy makes this really delicious dish with shrimp, corn from the garden and cherry tomatoes, also from the garden. It’s so good that I’m going to break with tradition and try to grow a corn patch this fall – plant in early September; harvest in late November. I didn’t use all the seed this spring so all I have to lose is left over seed and garden space – of which I have plenty – so why not. The risk is that we get a serious fall storm in which case I would have grown more stalks for the compost pile. Late breaking news – fire in the kitchen of the Funky Pelican so it’ll be out of commission for a bit. Probably good news for Hidden Treasure. What an incredible mess our foreign policy is. Amateur Hour. Six years with a president who should still be a community organizer in South Chicago and without a Secretary of State is setting our foreign policy back 100 years. All around the world. Every bad guy out there knows the US will do nothing but talk and that the opportunity to advance is right now; every ally knows their back is totally uncovered. It’s hard to believe just how screwed up things have become in just 6 years. Screwed up in the Middle East, in Eastern and Central Europe, in the Far East, in North Africa, even in South America. I’ve never used the mute button on the TV as often as I do now during the news. For the first few years I assumed we were just witnessing this administration’s lack of experience and incompetence. Now I’m thinking there may be something darker going on. We’re living in full on Florida summer now. Hot, hot, double hot with bursts of serious, can’t see past the hood of the car, rain and lightning blasts that rock the house. In the last 4 days we’ve had 7” of rain so you can just guess what the humidity is. My routine is to be out of the house doing garden or jungle work by 8AM; totally wiped out and dripping by 11AM; finishing off by a noon plunge in the lake; drinking a Nutribullet green drink by 1PM; then down at the dock with a new book or a pile of Sudoku puzzles until the storms start at 3PM. When do I get in any time to fish? Either early, early AM or just at dark or anytime Nancy has a bridge game in Palm Coast. Update – that 7” rain total I mentioned above is now 9” and the storm that came with it devastated the garden – mostly the corn. There were reportedly gusts of 60mph and it looked like it to me. 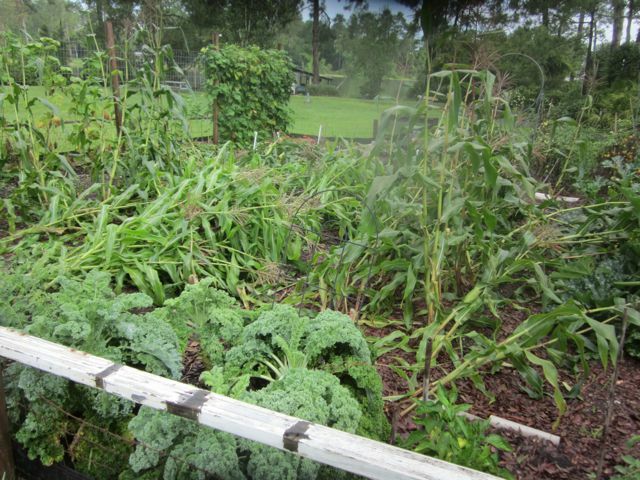 The combination of saturated soil and near hurricane force wind took it’s toll on the garden, particularly the corn. We luckily harvested a few dozen ears and maybe some of the really young plants will survive after I cut away the dead stuff but for now, it looks like the end of the corn season. I was glad to see that the trellis and pole beans were not blown over. The other thing that’s happened this week as a result of the storms is that several of those dead bay trees that I had not cut down, came down on their own. I knew that would eventually happen and also knew that when they did come down, they wouldn’t do any damage unless someone happened to be standing in the wrong spot at just the wrong time. None the less, it took a full 8 hours (over 2 days) of hard labor, a chain saw to get rid of the mess and a few Aleve for the cutter. The silver lining to all of this destruction is that now I have loads of corn stalks for the compost pile and when I complete burning off these dead trees, plenty of good potash for the compost pile. I made the best green drink of my short blending career yesterday. One Tuscan kale leaf, a collard leaf and some parsley for the greens; a couple strawberries, 1/4 of a small apple, ditto lemon, half a banana and a few chunks of frozen pineapple for the fruit; a large pole bean for protein, a couple of tablespoons of oats for the fiber then the new, magic ingredient – a small container of yogurt. Joey put me onto that and it really mellows the whole drink. Wonder how chopped up corn stalk would taste. I sure have a long position of that. I mentioned getting a new grill after the old one died. In my mind a grill is a family kind of device, not “mine”. So, for example, Nancy isn’t entitled to buy a “make-up”, balancing item such as a steam cleaner (is she?). We now have a Shark steam cleaner to add to the inventory of floor cleaning equipment and Nancy is a happy camper that balance has been restored. Big news/tragic news – the Holland Grill gave it up. When I grill a whole chicken on the Holland Grill it comes out looking like a picture from a cooking magazine but the last one I did looked like one from a fire fighter’s horror story. The usually blue flame was orange and the bird was very dark on the outside but not quite done on the inside. I took it apart to give it an extra good cleaning and noticed that the steel enclosure was basically rusting through which I think is allowing way too much air into the flame box. We’ve had this for 12+ years so I guess that’s not too bad for a grill in Florida. I tried patching the holes with aluminum foil but it’s too far gone and just crumbling in place. The final straw was a pizza that didn’t turn out perfect, the season’s first cherry tomato pizza. We use the grill several times a week, all year long so we can’t live without it. Off to the closest dealer which just so happens to be on the way to my new surf fishing spot in Palm Coast – how convenient. I know they have a stainless steel version of the same model I’ve always used but it’s quite a bit more expensive and I’m thinking if I can get another 10 years from a standard version, do I really want to pay more for stainless steel? I don’t think so. I know I can buy a heat resistant paint for grills so maybe I’ll just give a new one a good paint job during assembly, before lighting it up the first time. Grill update – my analysis was fine but we ended up with a stainless steel grill anyway. It will be delivered on Saturday. The guy made me a deal I couldn’t refuse. Well actually I could have but Nancy couldn’t. I started walking out when the salesman didn’t meet my generous offer but Nancy blurted out that we had to have it. End of negotiations. Also a first for the season, Nancy made the first spaghetti sauce from the garden. In addition to three varieties of tomatoes, the sauce includes green peppers, basil, parsley, and oregano so the garden is well represented. Using that sauce and half a dozen really nice green peppers, variety Snapper for those who care, she also made a batch of stuffed peppers. While name dropping varieties, I tried a new zucchini, Dunja, which is turning out to be fabulous. In 5 years of trying, the best I’ve done with zucchini is C+ and that’s stretching the grading system a bit. First nematodes got them and then boring critters that left larva to eat out the inside. The plants never really looked good but we usually managed to pick a handful that made it to the stove. This season and these plants are healthy and very productive. I don’t know if it’s just that I finally found the perfect variety or the conditions this year are just perfect. I’ll plant again in September in a different location and then we’ll know. The bear is back and marauding neighbor’s bird feeders and trash cans. I put mine in the shed and let the birds eat naturally so unless I happen to wonder out in the jungle after dark, not likely I’d even know they were here. The real bad guys that are back are the yellow flies. They normally appear, as if by magic, about mid May and can totally make being outside a miserable experience. These are kin to deer flies and horse flies with an orange/yellow body. The bites are big enough to draw blood and hurt like hell. For whatever reasons, we didn’t experience much of an infestation last year but they seem to me making up for it now. I’ve launched a counter attack which exploits a weakness in their defense. They are attracted to the color black so anyone wearing black clothes is first to be attacked. I feel sorry for Bob when he comes because he invariably wears a black T shirt and black shorts. That’s good for the rest of us but bad for him. The defense is to attract them to something black and deadly. So what we do is hang a black beach ball or equivalent that’s been coated with Tanglefoot. Tanglefoot is a super sticky substance such that once they land on the ball, they can’t get off – the old fly paper approach. I made 3 traps and have them hanging near the entrance to the dock. Tanglefoot is really nasty stuff to deal with and difficult to coat onto a beach ball without coating yourself. 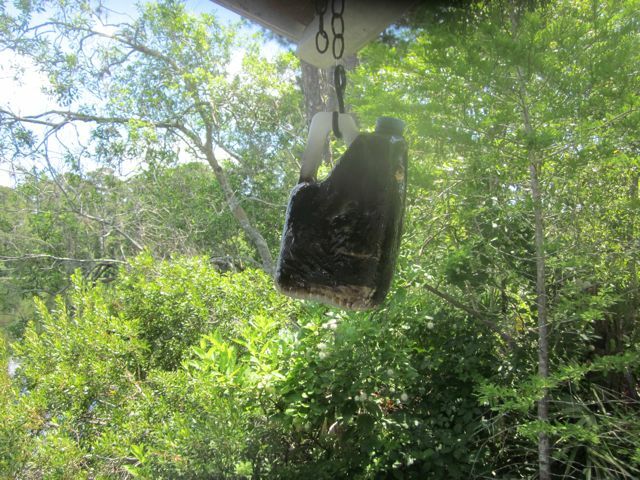 I’ve done this a couple of seasons now and substitute empty clorox bottles, painted black, for beach balls because they have a nice handle making them easier to deal with and hang. To round out a trifecta of bad guys – nematodes got the cucumbers. They hit late so we did manage to harvest a fair number but overnight the plants just died. This season I lost one (out of four) zucchini plants and six (out of six) cucumbers. Shame on me since I slacked off on my prevention techniques in those specific locations. I knew it when I planted them but was over confident that the critters had been defeated overall in the garden and gone on to greener pastures. I also had it in my mind, erroneously as it turns out, that all the fish carcasses I’d planted would gross out the nematodes. Nope. What I have to do is just dig out those areas and replace the native soil with compost. Does a coral snake count as a bad guy? If so, up the total to 4 bad guys. I don’t put them in the same class of bad as nematodes and yellow flies. Today was a two Aleeve day. You may recall several months back I did a major jungle clearing job. As big a job as it was, it didn’t come even close to cleaning the whole property but I needed a break. So today I started working the area on the West side of the house. That means cutting palmettos, trimming trees and wild shrubs – a job that requires getting into the thick of it with a vengeance. It’s also a job best done in the winter since I have to wear long pants and a long sleeve shirt to keep from getting cutting to ribbons and chewed on by mosquitoes, spiders and whatever else dwells therein. I actually came within a few inches of a small tree snake – no danger other than from a heart attack or banging my head on a tree limb when I lurched back out of danger. Man did the lake feel good after that workout.